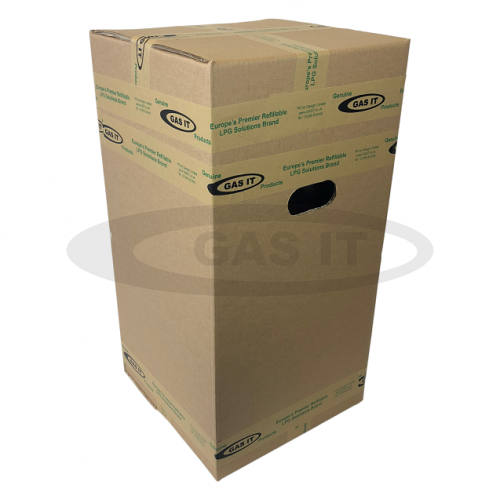 11KG Box for Bottles, GI-BOX-11KG - GAS IT Leisure Gas Bottles, Gas Cylincers and Gas Tanks - Catering, Motorhome, Campervan, Caravan, Farrier and Road Repair Refillable Gas Solutions. 1x 11kg GAS IT Shipping box. If your looking for protection to either store or send your GAS IT 11kg bottle on to someone then our heavy duty courier box is for you. We use these boxes when shipping new product to our customers in 1’s and it is made of two ply corrugated brown recycled cardboard with 2 pre cut carrying handle holes. We also sell these in packs of 10’s. The picture is for illustration only showing you a GAS IT bottle ready to ship in our box. These boxes are new and come blank with no printing or tape.